Starting Issue - Warning (Long Winded). K100-forum.com » Technical, repair and troubleshooting » Electrical » Starting Issue - Warning (Long Winded). I apologize but this will be a slightly long winded story/rant/vent. I have angered the Motorrad Gods and they have sent a gremlin to humble me. I have been cast down and seek guidance from the multiple Methuselah's who reside in this forum. As I have stated sever times I got my bike from a salvage yard and it was in poor condition. I got the bike in June and am having trouble getting the title. The thing was owned by Net Flix and used in a movie and they lost the title in some filing cabinet or something. So I am waiting impatiently for them to get a copy or whatever the slow corporate machine needs so that I can register the bike. This has resulted in me being unable to legally ride the bike and give it a good shake down. After the various repairs the only issue I have encountered to this point is a slight stutter that is very inconsistent when cold during idle. I admit to riding the bike 1 time for 7 miles violating all my personnel rules with no helmet, jeans, boots or jacket. But i had planned on 1 ride this weekend where I would take it out and blow the cylinders clean so to speak. As the battery is not the best I placed the trickle charger on the battery 2 days ago. Last night I tried to start the bike and it acted as though the battery was almost dead. The lights were dim and I could not hear the fuel pump. Now this bike sat outside untouched for 2 winters and I got that battery to hold a charge for weeks on end. So I don't think the battery sitting in a warm garage out of the weather would have killed it if it had survived to this point. I cycled the ignition switch and flipped the kill switch several times in minor frustration and for just a second I had full power again. Having read the multiple threads in the forum I immediately started checking battery connections and saw how poor the earth ground was. The poor thing was melted and in desperate need of replacement. I disconnected the battery, cleaned connections and improvised a new ground to verify that was my problem. I actually had to duck from the ricocheting screwdriver and gather my thoughts. So back to the forum. I know I have solid connections at the battery. I pulled the battery and placed it on the big charger and it has 95% charge. I am making a proper earth ground today and will reinstall the battery with it. My question is, Should I disassemble the kill switch and clean that? 1 thing that leads me to look specifically at that is due to when it does seem to have full power and i hit the start button everything dims again. I normally started the bike at least once a week just to listen to it and to let it know I care while we wait on the title. But as I went away last weekend due to my wedding anniversary thing it has been 2 weeks. So is the bike angry or the Motorrad gods? How to I exorcise this gremlin which plagues me? I beseech thee oh great Methuselah's! Guide me to the path of redemption. 1988 BMW K100LT ....minus the fairing. Ron I recently had a similar problem. Suggestions: First disconnect the battery earth & put a mA meter between terminal & frame to make sure there isn't a leak. Current should be near nothing with the ignition off. I solved my problem by eliminating the OEM kill/starter switch combination - that setup gets a bit flaky with age. I now have a separate after market starter and kill switch. I'll put a meter on it when I get home. Can you tell me what aftermarket switch you use? It sure sounds like the ignition switch to me Ron have a search of the forum there will be a few posts about fixing them and getting them apart. I found that in the downloads and will take care of that tonight as well. @Ron Ashurst wrote: Now this bike sat outside untouched for 2 winters and I got that battery to hold a charge for weeks on end. To verify that presumption, why don't you check the battery's voltage just before you try to start it after a typical week's idleness then after your first attempt to start it and let us know what it is. I would like to thank all for there input as it was probably a combination of the ignition and kill switches. both were in terrible condition. I started with the ignition and got more of a response so then went to the kill/start switch. Between those 2 that did it. Thanks to all who put the articles in the downloads section as well. That is just flat out AWESOME! Thanks again Gentlemen and Cheers! I am going to starting investigating the harness around the ignition switch first and kill/starter switch as well. Could the alarm box under the seat have anything to do with it? I had opened it to see if it was possible to restore it. @Ron Ashurst wrote: The Gremlin is back. Doh! Don't you just hate those knock backs? If you have cleaned up the ignition and start button & kill switches and have a known good battery (did you do the milliamp leak check thing to ascertain if you have a short circuit to earth somewhere that is draining the battery?) then the next place to look is at cleaning up the main earth connection (under the tank, left side - earthing point connects to the frame) - a poor earth will give all sorts of temperamental starting and running issues. After that, take a look at the starter brushes - easy enough to get at and brush kits are readily available - it's all part of the earth path and can cause frustrating electrical issues. Keep going - you are bringing a neglected bike back from the scrap yard and though this process will both learn a great deal about her and then be rewarded for your efforts when she is back on the road (legally). Get the alarm box off the bike. You aren't the first to have a problem with it. There is a definite harness issue. I was wiggling the wires behind the ignition and the choke light came on. Then it went out and I got full power back and so on. The Choke was not on. I checked just to make sure I wasn't having a stupid moment. I know I need a new battery and plan on getting one this winter as funds permit. I will accept the fact there will be no ride this year and simply tear it down and roust out the gremlin. Point-Seven-five. Is there a thread here on removing the alarm. Thanks for the encouragement Born Again Ecentric. I love working on bikes. My sister said there is a book called "The Zen of Motorcycle Maintenance". An alarm schematic is in this MB.C post and other useful links are within that same thread. @Ron Ashurst wrote: My sister said there is a book called "The Zen of Motorcycle Maintenance". "Zen and the Art of Motorcycle Maintenance" by Robert M. Pirsig. Tried to read it once and didn't get passed Chapter one-half. LOL. I guess it's better in the application than the reading. @Ron Ashurst wrote: LOL. I guess it's better in the application than the reading. I think I have it narrowed down to the connector for the ignition harness. It has 2 180 double backs that were tight with no service loop. I Cleaned up the earth grounds under the tank as well. I tried the milliamp leakage but my meter is old and showing 0 and I know that is not right as the clock is working. So I'll borrow a Fluke from work Monday and re-check that. I am going to try and clean the starter brushes and check to see if that is an issue. I was trying to read about removing the alarm but got kind of lost on that process. Laitch,I do't know why but I am not seeing any attachments or pictures in that thread on the alarm. Yup - BMW used one loom for both the low handlebars and high handlebars and folded up the unwanted bits under the tank. I keep forgetting about that because I built a new loom from scratch years ago. The other possible failure point is where the loom passes through the fairing spider on the way to the headlight etc.. It rubs quite badly there. Jeez Dai. Serious? You built your own harness? I got the starter apart and the commutator ring is filthy. Once again those downloads are awesome. DO NOT under any circumstances POLISH the commutator ring. Just clean the crud off with meths or similar. The reason for the shouted warning is that when new, the copper segments are full of micropits. The carbon from the brushes fill up those micropits making both a better contact surface and (over the long term) reducing wear on the brushes. If you polish the segments to a nice bright shiny copper, you'll just force the brushes to repeat the process. If you've beaten me to it - ah well, you know for next time! I did not polish Dai. I followed the procedure and used contact cleaner and a tooth brush. But now I am getting even more confused. I cleaned the starter and the external connector. I cut out the suspect connector and took care of that. I reinstalled the battery and connected the ICU. I turned on the ignition and seemed to have good power. I hit the starter button and heard and odd noise. It was kind of like a pop but deeper sounding and seemed to come from down by the foot brake area but cant be sure. I pressed the starter again and i heard a click in the relay box. After pressing again I hear a whirring type of noise from the relay box. And when I do this all the lights go dim. Almost out. I have 12.4 volts coming from the battery. @Ron Ashurst wrote: Laitch,I do't know why but I am not seeing any attachments or pictures in that thread on the alarm. You need to be a site member. Lights go dim, ALMOST out? There is a Load shed Relay and the lights are supposed to go out. It cuts power to everything apart from what's needed to start the bike. But I don't think you should hear a whirring noise. I wonder is there a faulty relay in there UNLESS its not getting enough power/voltage. BUT 12.4 volts from the battery is too low and you need to sort that first as its not enough to get you started. Charge up and test the battery first before going further. Mine shows 12.8 volts at rest before starting. I am pretty sure it is like Olaf said, It has to be the battery. I checked the clutch switch, kill/starter switches and replaced ignition switch wiring. I am only getting 12.4 volts out of the battery and it immediately starts dropping down to 9.6V. When I hit the starter button it goes to 5V. I have good continuity in the kill/starter/ignition switches. I have a 0.7 ma bleed on the earth ground. I took the load shed relay and starter relay to work and tested them on calibrated equipment and they operate fine at 12.0V. I am only getting 8.7V to the load shed so it is not engaging. The whirring noise i heard is actually the starter relay chattering from the under voltage. So I went down and ordered a Yuasa High Performance battery and it should arrive Monday. 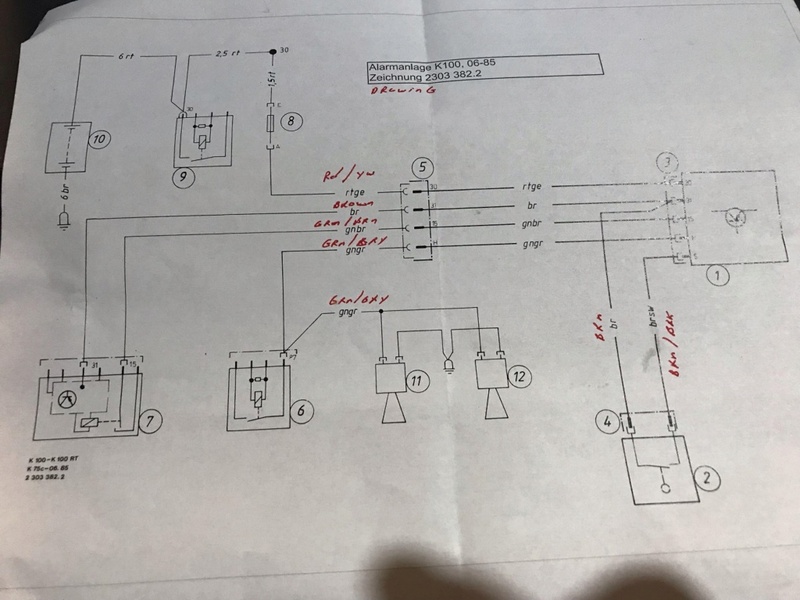 I got the wiring diagram for the alarm unit and want to remove it. The diagram for my bike was a PDF in German. But there is no Key to the diagram. Does anyone know where I can find the key to that drawing or has anyone removed an alarm from a 88. If so please PM me as I am kind of lost on removing it. Posting the PDF of the drawing to which you refer might help others to identify its components. I've been trying to figure out how to do that but have had no luck so far. @Ron Ashurst wrote: I've been trying to figure out how to do that but have had no luck so far. Take some photos of the drawing with your phone or camera then post them. I know 1 and 3 is the Alarm Unit and connector and 2 and 4 is the key activation which is N/C. 5 is the white barrel connector. 7 is the temp relay. But i just don't know how to remove this thing and not kill the bike. @Ron Ashurst wrote: But i just don't know how to remove this thing and not kill the bike. Does the alarm have a 12-pin connector? you rode an unregistered bike that you don't own with no clothes on ? I sure hope you were drunk ..
Unplug the four-wire connector—#5. That should disconnect the alarm from the rest of the system. Unless you've replaced it, your moto's battery seems faulty, as Olaf has observed. That would interfere with proper function of components. New battery should be here Monday. If it acts proper with the new battery i will unplug the barrel connector and see if it still runs. But seriously, I can't be the only person who ever rode naked. @Ron Ashurst wrote: But seriously, I can't be the only person who ever rode naked. You're right, of course. Lady Godiva is on the list, too. This is a neater version of the drawing with what I have been able to trace in the alarm wiring. With this information will unplugging it disrupt the bike? Anyone? 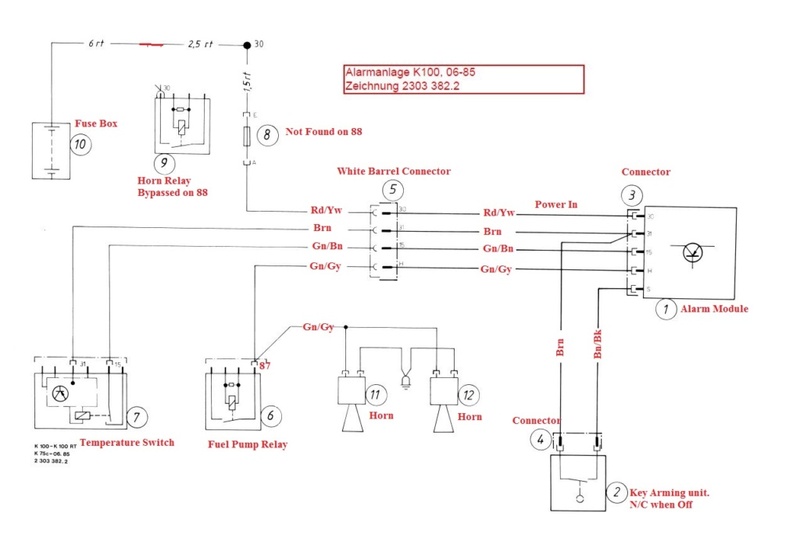 @Ron Ashurst wrote: This is a neater version of the drawing with what I have been able to trace in the alarm wiring. Unplug it to find out. If it does, plug it back in. Of course, if you have a dead battery, you can't beat that for disruption. A new battery and it cranks like a champ. Relining the tank so i'll have to wait for that. Thanks for all the help gentlemen. Got the tank back on and the bike runs fine. Unplugged the alarm and the bike runs fine. Alarm is now in the trash. Good call Laitch. Thanks for all your help. » Im having trouble starting my 14 hp I/C OHV motor. » How long do pike live?